Digital Showers > Digital Shower Pack, Bath Filler, Remote & Round Head (LP). Contemporary 2025 two outlet digital shower pack with LED colour changing lights, processor unit, 8" round shower head, wall mounting arm, remote control and bath filler with waste (low pressure systems, pumped). Designed to look perfectly at home in modern bathrooms. Simple push button controls both inside and outside the shower. Two outlets (shower / bath). 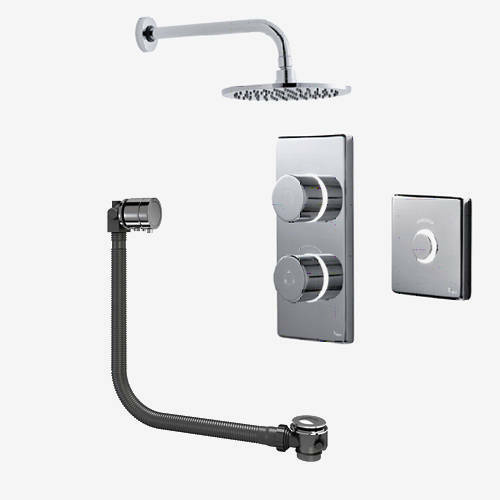 8" Round Showerhead and wall mounting arm included. Xofill Bath filler with waste included. Low-pressure digital shower with a built in pump that boosts the water pressure to 1.5 bar (brushless motor which is much quieter and more efficient than conventional motors). Fit this remote control anywhere outside the enclosure (up to 10 meters away from the processor). Remote control: press the button to turn the shower ON/OFF (press and hold for 1.5 seconds to divert the shower on 2 outlet options). 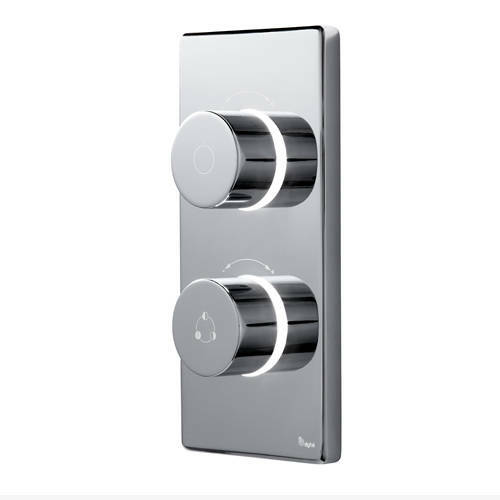 Press the divert button once for one shower outlet, twice for the second shower outlet and three time for both shower heads to run at the same time. Two controls for temperature and water flow. This luxurious trim combines elegant lever handle and is finished with touches of ceramic. Fully thermostatic for complete piece of mind. 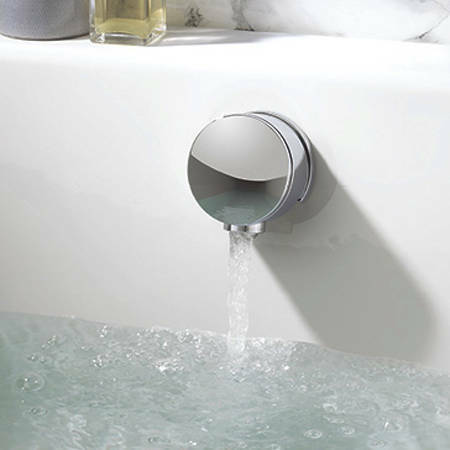 Precise temperature: sophisticated technology gives you accurate control of the water temperature. Consistent temperature: a built-in thermistor checks the temperature 10 times every second so that, even when someone is using water elsewhere in the house, the water temperature will stay exactly the same. Temperature override: processor has a pre-set maximum temperature of 41�C, which can be overridden and adjusted to 46�C. White: turn your shower on by pressing the control dial and see the controls flash white as the water reaches your set temperature. When the water's just right, the controls will give a subtle white glow. Red: precise controls let you adjust the temperature as you shower turn the temperature up and the control will flash red. Blue: turn the temperature down using the in-shower controls and the light will flash blue as the water cools. Automatic shut off: if there are any problems with your water supply, the shower will shut off immediately. 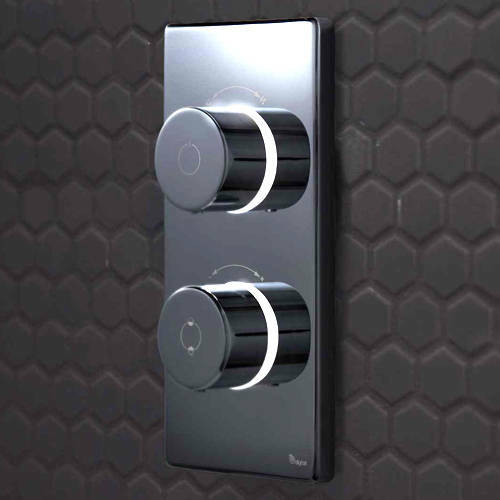 Cool-touch metal controls: controls are kept completely separate from the water in the valve, which means they always stay cool and safe to touch. Optional remote control can be installed (sold separately). Cleaning mode: while the shower is off, set the temperature to midway between hot and cold, then press and hold the dial for 5 seconds. The light on the controller will come on to show you it's locked, then after one minute it will automatically unlock. Innovative digital processor forms the core of this digital shower. The processor can be fitted up to 10 metres away from the control unit (digital valve). Push-fit electrics: twist and lock electrical cables ensure there is no need to go inside the digital processor to set up the shower. It also makes maintenance a simple task. The highly reliable Fl�hs ceramic cartridge for a long life. Push-fit isolation valves for fast and easy installation. Hot and cold water isolation valves allow you to isolate your water supply without having to switch it off at the mains. 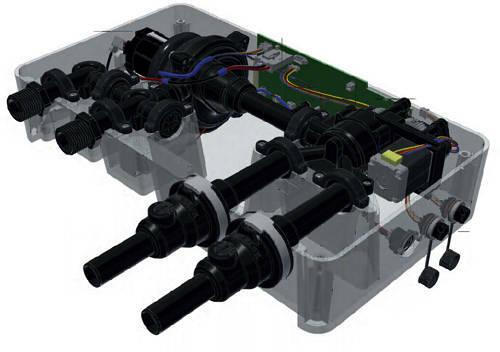 The digital processor can be installed in a few different locations depending on the layout of your bathroom and your own preferences (please see technical drawings). Minimum pressure required for low-pressure pumped installation 0.1 bar. Suitable for low pressure plumbing systems. Suitable for gravity and low pressure mains systems (built in pump). Size: 208H x 112W mm. Total safety, easy installation and low maintenance. 5 Year guarantee: Bathroom Brands guarantee their Digital Showers for 5 years. The new Digital Showers collection from Bathroom Brands is the latest innovation using precise temperature technology and beautiful high quality design. With this selection of premium shower products you are able to create a showering experience individual to you and your home. The precise temperature control means that the water temperature stays exactly the same throughout your shower. For safety there is an automatic shut off which means if there is a problem with your water supply the shower will shut off immediately. 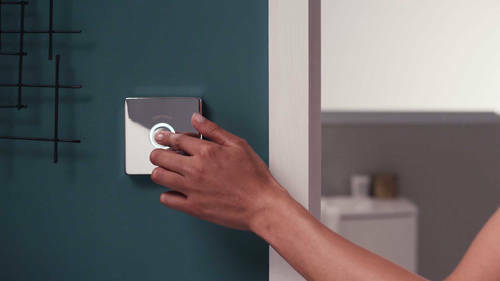 Colour changing controls not only look good but indicate when your shower is heating up or cooling down. Bathroom Brands supply the highest quality materials while using the finest manufacturing techniques, they offer a wide range of styles from classic bathrooms to elegant modern bathrooms, blending style, quality and function with beautiful designs and the chance to have the best in smart bathroom functionality.